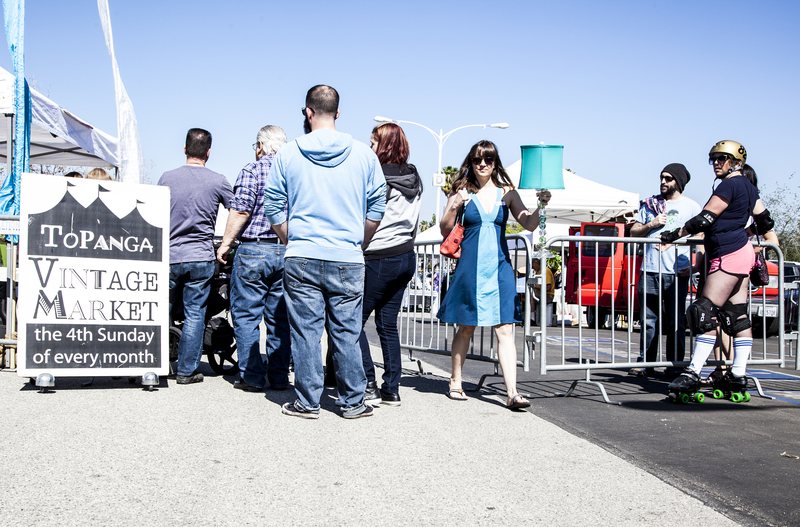 Visitors and buyers wait in line to get into the Vintage Market on Feb. 23. Photo: Lynn Levitt. Contracts and timing have vexed the Foundation for Pierce College’s fundraiser with the Topanga Vintage Market (TVM), officials said, stripping them of badly needed operational funds. The Foundation’s financial manager Kathy Zanghi said they secured TVM as a vendor in October 2013 before they had a new agreement with the college – it was subsequently approved in November. “There were a number of issues at that time because the Foundation had no [charter] contract with the Los Angeles Community College District (LACCD) to even exist,” said Larry Kraus, associate vice president of Administrative Services. Pierce College President Kathleen Burke said the college assisted the Foundation by allowing TVM to operate under a college agreement. Foundation officials said TVM was looking for a new place to set up and they didn’t want to miss out on the financial opportunity. The Topanga Vintage Market website states the flea market outgrew the Westfield’s Promenade Mall parking lot in Woodland Hills and now they’re a fundraiser for Pierce College the fourth Sunday of each month. Zanghi said, “as the ink was still wet” on the charter contract, they drafted local permit and fundraising documents with the college to get TVM back under the Foundation. Foundation officials said they have little legal support to navigate the documents. “It seems that they’re assuming we are all attorneys and we’re not. We’re just trying to keep the Foundation going. We’re trying to be professional,” Zanghi said. Kraus said the Foundation cannot take this type of permit and write a third party permit off of it. The Foundation then submitted a new contract to LACCD to cover past and future TVM events under the permit, Zanghi said. Kraus said LACCD does not approve these contracts retroactively, however. Foundation officials said they were frustrated by the contract process but continued with TVM in legal limbo January through March. They resubmitted a contract in March with current dates, but altered some of the language. In a March 25 email, Kraus told the Foundation they would have to consider cancelling the market event in April if they could not “circumvent the language in the agreement” and provide a special event insurance rider that LACCD was “adamant” about. The college had its own permit ready for TVM to sign if the Foundation faltered but the Foundation made an attempt to fix the language. “We just corrected and did something but we didn’t write the contract,” said Senior Program Director Floriya Borzenkova. The Roundup reached out to the LACCD contracts division but the administrator who answered was not authorized to speak with the media. The Roundup left a message for Leila Menzies, vice president of administration, risk management. Burke and Schleicher said that the college could see repercussions from the district if contracts, leases and funds are not handled appropriately. As a non-voting ex-officio on the Foundation’s board, Burke said her role is that of a designee for the board of trustees to ensure they operate in a legal and ethical way and in a way that does not harm the college. Schleicher said their goal is to ensure the college does not lease land inappropriately and focus the Foundation on soliciting donors more than running enterprises. The Topanga Vintage Market’s contract with Pierce College terms out June 24. Visit www.topangavintagemarket.com for more information.